A matzo ball is a traditional Jewish dumpling made from unleavened dough. Matzo ball soup consists of matzo balls, chicken stock and seasonings. The primary source of calories and matzo ball soup is fat from the chicken stock. This nutritional information applies to 1 cup of matzo ball soup. A serving of matzo ball soup contains 118 calories, which provides about 20 percent of the daily value for calories. This daily value assumes a standard diet of 2,000 calories per day, according to Fatsecret. The calories in a serving of matzo ball soup consist of 49 calories from fat, 42 calories from carbohydrates and 27 calories from protein. 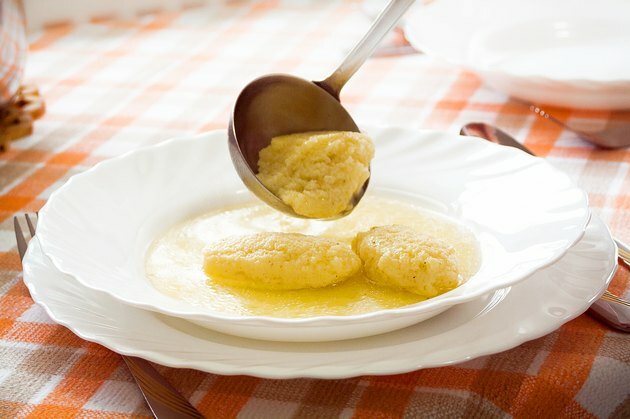 A serving of matzo ball soup provides 5.42 g of fat or about 8 percent of the daily value for fat. The carbohydrate content in matzo ball soup is 9.74 g per serving, which is about 3 percent of the daily value for carbohydrates. Matzo ball soup also provides 6.65 g of protein, or about 13 percent of the daily value for protein. The serving of matzo ball soup contains 1.159 g of saturated fat, which provides about 10 calories. This saturated fat content represents about 6 percent of the daily value for saturated fat.